Poor. Folio. Wraps for Lamento para flauto baja and Nocturno para flauto en sol, but contains two copies of Nocturno, thus poor, else very good. Each copy is one large leaf folded with the piece and instructions. 3 leaves. Nocturno is a lyric piece using alternate fingerings and multiphonics. 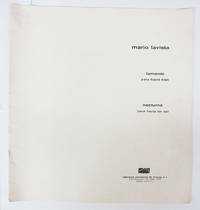 Flute and clarinet catalog from the publisher included featuring compositions by Lavista, Rodolfo Halffter, Gutierrez Heras, Jimenez Mabarak, Blas Galindo, Luis Sandi, Mario Kuri-Aldana, Jesus Bal Y Gay, and Leonardo Valazquez.